A representative for Aretha Franklin confirmed Thursday, August 16, that the Queen of Soul, 76, has died in her Detroit home. The following is a chapter from the forthcoming hardcover, "WOMEN WHO ROCK: Bessie to Beyoncé, Girl Groups to Riot Grrrl" (Black Dog & Leventhal; October 9, 2018). Edited by Evelyn McDonnell. 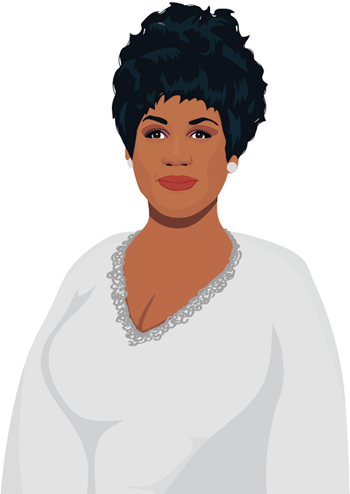 Illustration of Aretha Franklin by Julie Winegard. The indisputable Queen of Soul, the almighty Aretha Franklin has had hits across four decades, singing soul, gospel, jazz, R&B, funk, pop, rock, opera, show tunes, and standards of the American songbook. She has had more than twenty number-one singles, has won eighteen Grammy awards as well as the Grammy Lifetime Achievement Award, was the first woman to be inducted into the Rock and Roll Hall of Fame, was the youngest artist to be accorded the Kennedy Center Honors, and received the Presidential Medal of Freedom. She performed for queens, popes, and presidents, and sang at the funerals of Dr. Martin Luther King Jr. and Mahalia Jackson. She made Barack Obama cry over her show-stopping performance of one of her all-time greatest records, “(You Make Me Feel Like) A Natural Woman,” at the 2015 Kennedy Center Honors. The breadth of her accomplishments makes it seem inadequate to simply declare her the greatest singer of our time. She is Lady Soul; she is blues personified; she sings the gospel from a place so deep an unbeliever will feel the presence of the divine. If Aretha—and she is the original one-named diva—takes a liking to someone else’s song, watch out, because she will turn it inside-out and make it her own. Just ask Otis Redding: the first time he heard her version of his “Respect,” he told Jerry Wexler, with a big smile on his face, “This girl has taken that song from me. Ain’t no longer my song. From now on, it belongs to her.” Sarah Vaughan refused to sing “Skylark” after Aretha got her hands on it. Aretha would also place herself firmly on the right side of history as a leader of social change, loaning her tremendous talent to promote justice. She firmly stood up for civil rights, answering the call from the Southern Christian Leadership Conference whenever they asked, or stepping up to play benefits for African American causes ranging from the families of the victims of the Attica prison riots or assisting Jesse Jackson in bootstrapping his Operation PUSH, an organization to help improve the economic status of African Americans in Chicago. Aretha was raised in an environment where there was no difference between moral justice and social justice; her father, the activist/minister/singer C. L. Franklin, connected racial equality and economic parity from the pulpit early on. While she was born in Memphis, she moved north, first to Buffalo, then to Detroit—the place she still calls home—with her family as her father advanced his ministry. Rev. Franklin was comfortable behind the pulpit as well as in the media, hosting his own radio show in Memphis and Buffalo. In Detroit, C. L. Franklin began making records and touring the gospel circuit. B.B. King referred to him as “the bluesman’s preacher” because Rev. Franklin didn’t see a divide between church music and secular music; “it all comes from God,” he used to say. Aretha’s gift manifested itself at an early age, even for a city like Detroit, where serious music talent flourished in abundance. She became part of Rev. Franklin’s service and his traveling ministry, on the road at the age of twelve. So she never had to make the choice that agonized so many other artists about whether she was going to stay in the church or seek commercial success. The Rev. Franklin was her de facto manager in the early days, and both of them looked to the careers of artists like Nat King Cole and Sam Cooke, who successfully crossed over into the mainstream from gospel. For the Franklins, père et fille, the goal was to sing it all; there was no material Aretha couldn’t handle. Only Aretha Franklin could release five albums under legendary talent scout John Hammond at Columbia Records and have them be a minor note in her career. The lack of success for her Columbia material wasn’t due to lack of quality, but rather to the fact that she had not yet developed a singular musical vision. When that contract ended, she moved to Atlantic Records under the aegis of the legendary Jerry Wexler, and within a few weeks of entering the studio along with the Muscle Shoals Rhythm Section, she had her first million-selling, crossover hit with “I Never Loved a Man (The Way I Love You).” Two months later, her “Respect” went to number one on both the pop and R&B charts, and it would become the hallmark of her repertoire. “Respect,” as well as “Think,” which would come shortly thereafter, became anthems of black pride and power, as well as feminist equality. Her voice is enormous and ferocious and will not be denied. While Otis smoothly, ardently pled, Aretha did not ask: she set the terms of engagement. With “Respect,” Wexler was originally concerned that Franklin would be able to deliver a rendition sufficiently different than the original; not only did Aretha flip around the arrangement, adding a strong, hypnotic rhythm and cadence, which adds to the song’s urgency, but her voice crackles with electricity, full of endless power and promise. In 1976, Franklin went to work with Curtis Mayfield on Sparkle, a jewel of hot buttered soul that should be a classic of the era, as much of a concept album as Marvin Gaye’s What’s Going On. It is a record like nothing Aretha had done before, or since, and was the next logical step of her career, solid thematically and musically from end to end. Sparkle should have been the beginning of Aretha’s next act. Sadly, she did not deliver on that promise. Just when the industry was ready to count her out, Aretha came back in the eighties, starting with her delightful cameo in "The Blues Brothers" movie, performing “Think.” She signed with Clive Davis and Arista records, and Davis helped match her with the right producers, beginning with Luther Vandross on 1982’s Jump to It, which would provide her first gold record since Sparkle. Like she did back in her Columbia days, in the eighties, Aretha wanted hits. That goal was achieved with 1985’s Who’s Zoomin’ Who. The joyous “Freeway of Love” was her biggest hit since “Respect,” and her duet with Annie Lennox of Eurythmics, “Sisters Are Doin’ It for Themselves,” put her behind an equally feminist anthem. Aretha (1986) served up a funky, modern, and deeply soulful cover of “Jumpin’ Jack Flash” for the movie of the same name, at Keith Richards’s personal request. The enormity of Franklin’s talent may have best been exemplified at the 1998 Grammy Awards. Franklin, there to perform “Think,” was asked to pinch-hit for Luciano Pavarotti, who was supposed to sing “Nessun Dorma.” She had learned the aria for a private benefit concert that took place a week before, but this was a different arrangement, with a sixty-five-piece orchestra and a twenty-voice choir, and on live television. Aretha asked two questions—was the arrangement in her key (no) and was there a tape (yes)—before agreeing to do it, with less than half an hour to prepare. “She wasn’t afraid of the aria,” said Jerry Wexler, which is a severe understatement. She interpreted Puccini as Aretha Franklin, and the result was nothing short of magnificent. It was broad, deep and colorful, full of pathos and triumph and exultation, and her voice, while not perfect, more than stood up to the performance of one of grand opera’s greatest arias.